Big-city art for the inhabitants of big cities was primarily the creation of the artists and intellectuals of Berlin in the two decades from 1910 to 1933. 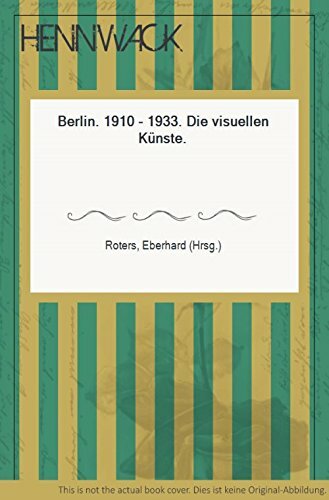 Berlin witnessed an explosion of creative, individualistic experimentation that enthralled the art world of its time and is the subject of this exciting overview of an extraordinary place and period. The influences of that new art of Berlin are still at work today. As the newcomer among Europe's big cities - Paris, London, Vienna - Berlin was born during the Industrial Revolution and comparable to New York in many ways. As the capital of Prussia, Berlin started to develop during the 19th century and, in particular, after the foundation of the German Empire in 1871. With breathtaking speed, it became the center of a modern industrial society; at the same time, however, Berlin was the seat of the ruling house of Prussia, known for its archaic ideas of empire. This is only one of the contradictions that resulted from such rapid growth. The effect of Berlin's internal contradiction on a 20th-century society that lives to a large extent in big cities fascinated and attracted artists and intellectuals, and provided the basis for the creation of a new kind of art there between 1910 and 1933. The same contradictions that gave birth to this new type of art also destroyed it. Within two decades, artists in Berlin were confronted with prosperity, inflation and the Great Depression. The barriers between the various forms of art were almost completely removed, and artists of world renown in every field, from architecture, painting and sculpture to theater and film, participated in this heady period of creation. Among a multitude of artists then working in Berlin were Kirchner, Grosz, Dix, Heckel, Schmidt-Rottluff, Pechstein, Kokoschka and Malevich; among architects, Behrens, Taut, Mendelsohn and Wagner; in the theater Reinhardt, Pescator and Brecht; in film Lang, Murnau and Pabst.